Buy dermaroller at 20% off from h2bees. Free shipping. This dermaroller contains 540 micro needles and is ideal for solving skin problems such as scars, stretch marks, cellulite, acne scars and wrinkles. Free shipping and 30 days return. 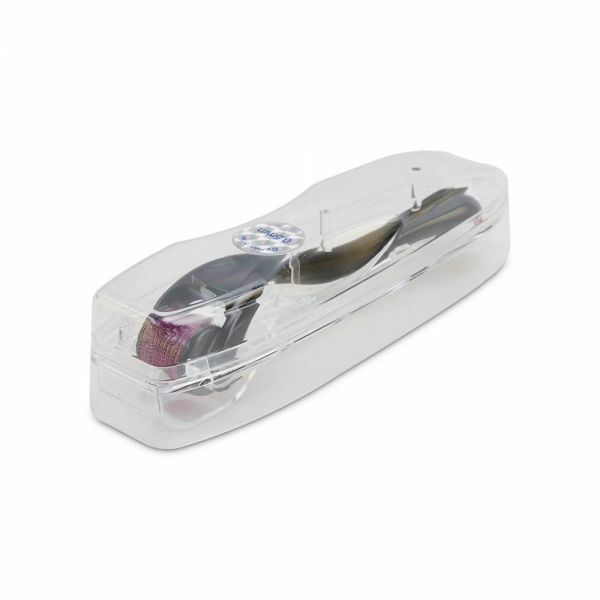 This dermaroller contains 540 micro needles and is a great tool for skin lifting and rejuvenation. It is ideal for solving skin problems such as scars, stretch marks, cellulite, acne scars, and wrinkles amongst others. A derma roller is a skin care device made of many high grade micro needles that when rolled on the skin, creates tiny punctures in it which pushes the pores open for a short period of time. The body reacts as if it is damaged, and releases growth factors that stimulate the production of collagen and elastin, which forms new healthy skin. The roller can be used on almost all parts of the body, except the eyelids and lips. Derma rollers have become increasingly popular over the last decade and people use them for all sorts of skin related problems. You can use the dermaroller for stretch marks problems which is a common one and even hyper-pigmentation. Derma rollers are commonly used along side skincare products such as serums, anti-ageing or anti-wrinkle serums/creams and moisturisers. These serums and creams are able to penetrate the skin deeply due to the holes that are put in place. The results achieved are very effective and improves your skin. 1. Stimulate collagen growth, which improves the appearance of scars, wrinkles, acne scars, fine lines and stretch marks. 2. They allow the application of gels, oils and creams to be absorbed into the skin far more easily and effectively. This works well especially with cellulite reduction. The 0.25mm derma roller is the perfect needle length for daily use and it is very popular with beginners. It thickens the epidermis making it easier for the skin to respond positively to different skincare products. It is the most suitable needle size for the areas around the eyes and neck. The 0.5mm derma roller is the perfect needle length for anyone with light scaring, shallow wrinkles and hyper-pigmentation from the sun. 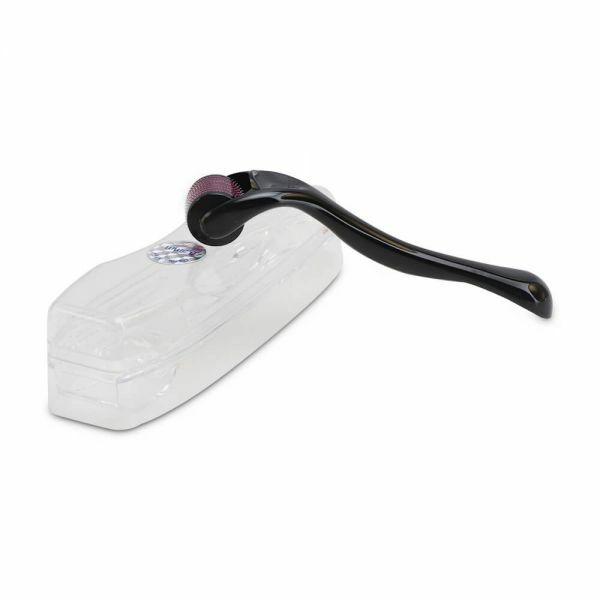 This dermaroller is usually used for the face only. A numbing cream may or may not be required as a user will normally not experience any pain. It is a handy tool for your skincare regime and helps with the boosting and absorption of skin products. This 0.5mm is a good needle length for those starting out using a dermaroller. Results and effects will vary from person to person. The 1.0mm dermaroller is very effective in collagen production and for face skin problems. This needle can treat uneven skin textures, light stretch marks, strong blackheads, deeper scars, acne scars and wrinkles. Results will vary from person to person, but you are more likely to see faster results with tighter and smoother skin. If it hurts whilst using the dermaroller, use a numbing cream. 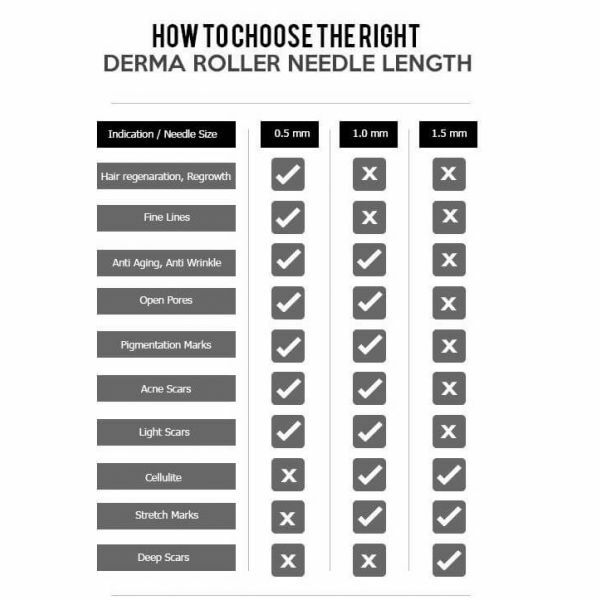 The 1.5mm dermaroller is best used on the body rather than the face. This is because the length of the needle is very deep. This needle length is ideal for stretch marks, deeper wrinkles, cellulite, deep scars, hands, arms and thighs. It is not recommended to be used by a beginner and a numbing cream should be used. It may also cause a bit of pain, so usage should be spread apart longer, for at least 3 – 4 weeks. 1. Would my skin get damaged? Derma rollers do not damage the skin and leave the epidermis fully intact. 4. Are the needles sterile? Derma rollers have become a very popular form of skincare therapy treatment. It is very effective in its results, solves everyday problems that people face such as scars, stretch marks, cellulite, acne scars, wrinkles and hyper pigmentation. It is a beneficial addition to any skincare regime and when used regularly will get you results with time. Also works great when used alongside your favourite face serum as well. How to use derma roller 1. Disinfect your roller. 2. Apply lotion or numbing cream on area of the skin that the roller is to be used if needed and make sure that it is clean. 3. Begin derma rolling in one direction until you have covered the entire area of the skin you want to treat. 4. Maintain the same speed and pressure to create more micro vessels. 5. Repeat in a perpendicular direction, so if you have rolled vertically before, now roll horizontally. 6. After you finish, apply mask products or nutrition on the skin that requires care in case of skin inflammation.